We live in a constant struggle to steer through the big and varied torrent of data which is unleashed everyday. And “data” can cover many different things. By following the Concise Lexicon for the Digital Commons created in 2001 by the contemporary art group Raqs Media Collective, data could be ‘artistically’ defined as follows: “Information. Can mean anything from numbers to images, from white noise to noise to sound. A weather report, a portrait, a shadow in surveillance footage, a salary statement, birth and death statistics, a headcount in a gathering of friends, private e-mail, ultra high frequency signals, sale and purchase transactions and the patterns made by pedestrians as they walk in a city – all of this can be and is data. Data, like coal, uranium and other minerals vital to the running of the world economy is mined, processed, refined and sold at a high price”. The information visualization field has emerged to make these complex sets of data more accessible and understandable. By using cartographic information and visual metaphors, artists and data mappers aim to visualize and re-visualize these informational territories; “areas of control of digital information flow in an intersection with a physical area” . Virtual, invisible, infinitely small or large, multidimensional, time-based, and even cultural and political spaces are the informational terrains that need to be grasped better. But some of these new informational territories are invisible spaces that we cannot perceive at all. The Internet, along with the stock market, the human genome, the global corporate power or the electromagnetic space are good examples of these spaces. What are the different ways in which, for instance, the electromagnetic space can be visualized? How do artists, activists or scientists deal with the goal of selecting, categorizing and visualizing data from this “invisible” space? What are the political implications of visualizing the radio spectrum? The map showed the effects that such facilities can have on nature and humans living in their everyday surroundings. By developing a critical and political position of the military use of the electromagnetic space, the artists opened a debate about the use made of this informational territory by governments. They visualized the agents and actors involved in this network by paying attention to the relations generated between all actors involved. The info-graphic which resulted from this research was a map depicted as a mural that only could be well-perceived in person, that is to say, by observation of the content in an exhibition, where the map is reproduced in a higher scale to make it understandable. Furthermore, the information dumped into the graphic is not directly obtained from a dataset but from different sources; people involved in the construction, the historical archives or the scientific electromagnetic information obtained. Although connections and facts were represented in this static map, there are other computer-based approaches that can offer more enriching possibilities of interaction for amplifying cognition and better understanding of this electromagnetic space. Another type of visualization technique that goes beyond info-graphics, in terms of aesthetics, interaction and availability is the information computing visualization. This approach also uses visual metaphors to make sense of several complex datasets but also applies new media techniques online. The Atlas of Electromagnetic Space is an interactive visualization of the Radio Spectrum available on the Internet. Its data set is referred to the radio frequencies located in “invisible” and non-representational spaces. 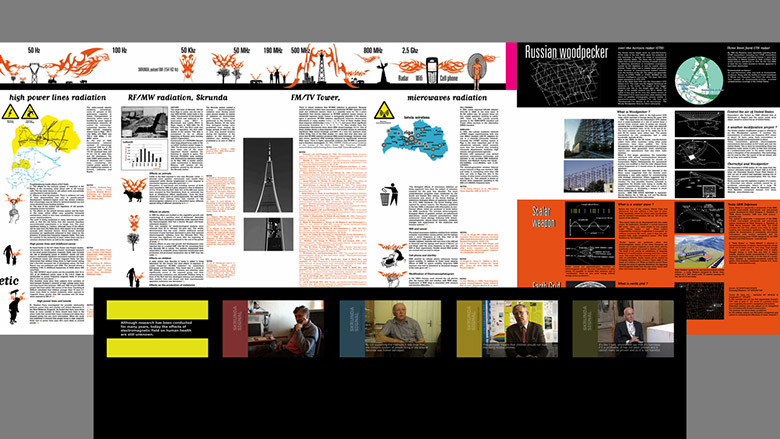 The project was developed by Bestiario in 2008 and presents several insights at the same time. On the one hand, the project is a clear and comprehensible representation of the ways the spectrum works scientifically. They show how much space is taken up by every kind of electromagnetic wave. Furthermore, it shows the spaces in which we can locate our everyday life technological devices or signals like Wifi, Mobile, Bluetooth, etc. On the other hand, these spaces are linked to different artistic projects that allow users to know which kind of interventions can be done within the Hertzian Space  in order to make us aware of its presence. The importance of aesthetics in this project provides a good example for understanding how information aesthetics can bridge the gap between functional and artistic attempts of visualization. By comparing to the previous example, we can easily understand the differences between information visualization and information aesthetics, term coined by Lev Manovich in 2002 in his essay ‘The Anti-Sublime Ideal in Data Art’. That means that by focusing on aesthetics as an independent medium that augments information value and task functionality, visualization techniques have been opened to interdisciplinary discourse that engages with design, art, communities and scientific research at the same time. Visualization art (data art) can be considered the most subjective way of expressing personal experience in information society. The understanding of data as “space” and the creation of visual relationships is an accurate way to express the subjective experience that takes place in the current information society. 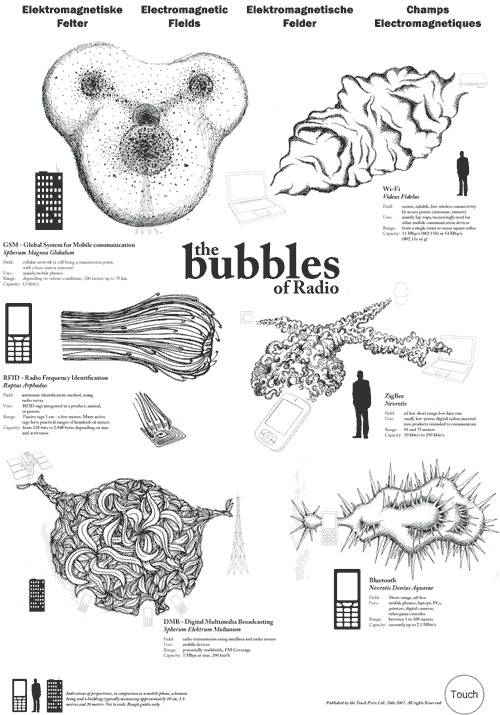 Bubbles of radio (2008) is a project developed by Ingeborg Marie Dehs Thomas based on the idea of representing our sensory perception of the electromagnetic space in abstract forms. Inspired by richly illustrated books of botany, zoology and natural history, the artist created the bubbles. This bubbles look like fictional species — drawings that visualize the different ways in which technologies such as Wifi, RFID or GSM inhabit space. She also used a critical and visual design for the bubbles in order to relate them to small and large scales to indicate proportions of the “invisible space” occupied by these technologies. Then, she compared scales between people, mobiles and buildings as it can be perceived in the picture on the left side. Artist’s intention was not to offer accurate actionable information but to open the debate on the radio spectrum into the tangible and physical. She focused mainly on the relation between this non-representational space and the physical space considering radio frequencies to be something which can be experienced through the senses and not only through the screen. Both the bodily and performative character of information are the key points of this project. By using abstract and subjective forms of living bacterias, the goal was to represent the invisible electromagnetic space as part of our environment, and as an important space deeply integrated within our daily activities. The project’s contribution is in offering another vision of the electromagnetic space integrated more as an intricate part of technologies in order to highlight its presence and implications on our lives. Through reflecting on how electromagnetic space can be mapped in different ways, my aim is to show a wide range of possibilities in which information could be visualized by artists. These artistic visualizations could consequently open political and technological debates. Mapping information (research, datasets, etc…) into visual forms has become a way of making sense of things not only through graphics and maps, but also through visualizations computing techniques, as well as more artistic visual representations. The huge data landscape can be mined, visualized and in some cases, experienced. These three projects are good examples of how information visualization can work as a socially engaged discipline that can contribute to revealing the non-representational spaces surrounding our current technologically ‘augmented lives’. They show us not only the way to critically engage in analyses of non-representational spaces shaped by the power, but also how to reclaim them.